If you’ve been waiting to see how the Galaxy S II measures up size-wise against other devices in T-Mobile’s line-up then we’ve got the hands-on shot for you. Without a “true” hands on yet we’ve only been able to grab a few “in the wild” shots floating around with our ninjas and unfortunately none of them showed the device stacked up against other handsets. This image was sent in with the hope that we would get a good comparison of how the Galaxy S II sizes up against the earlier generation Galaxy S 4G. That’s all for now, enjoy the pic! ← Did T-Mobile CMO Confirm No iPhone 5 For Magenta This Year? if they got rid of touchwiz i would jump on it. Bro this phone come with an unlocked bootloader for all you flashing needs. Which is one of the reasons why I still sold it and now patiently wait for the next nexus phone or the GSII on T-Mobile network. Ha ha. I asked TMob customer service that (for the Vibrant) about 6 hours ago. The answer was more or less to go frak myself. Why? Do you only want 21mbps? I’ll Take the 42mbps any day of the week!! I get 1 – 3 mbps in my area… so… I’d be totally fine with the Exynos processor w/ 21mbps. You get 1-3 mpbs with HSPA+…. but you have no idea what speeds you’ll get with DC-HSPA. 42mbps HSPA is a different animal, which could show significant speed improvements. I’d rather my phone not lag so much when I’m showing it off to my Friends/Family Members. Sure the Internet speed boost is good, but what use is it if the processor lag when rendering anything. I’ve owned the Sensation 4G, and if I’m correct the processor is at 1.2 Ghz. While I had the device the lag was there, and choked up once in a while. Which is the reason why I sold it, and waited for the GSII on T-moble. I do know the processor is clocked 300 Mhz more, but it’s still not the same. I will go try out the T-mobile GSII in stores to see it to appreciate it, but if it doesn’t impress I will wait for the next Nexus Device. Might have been the Sense UI that caused a bit of lag. While yes that might have be true. I am tired of lag while I’m playing games on my phone. Where the the processsor chokes the most. The GPU used in the Snapdragon is inferior to Samsungs GPU. Just Saying. The Sensation has 134,400 more pixels to render. BTW, are you not worried that the SGS2 has 480×800 resolution for 4.5″ screen. I wouldn’t get a phone with over 4″ screen and still has the 480×800 resolution. Based on certain reviews of the screen it is a trade off most people are willing to make for a more beautiful screen. Then again I never said I was thinking of purchasing this phone without checking the next Nexus device. Don’t get me wrong I loved HTC phones, but Qualcomm needs to catch up. Its the HTC sense 3.0 slowing it down. The Samsung UI isn’t as heavy. I have noticed on many occasions that the older Samsung Galaxy S 4g is quicker than the HTC Sensation 4g. I’m guessing the same will be true when pitting the HTC amaze 4g up against the Samsung Galaxy s II. But with the unlocked bootloader, Samsung has my money! don’t forgot the HORRIBLE HORRIBLE battery life on the Sensation i have to charge my damn sensation 3~4 times a day when i had my Samsung Vibrant i didn’t have to do this.. and i also would rather have the Samsung processor then the crappy qualcomm… i don’t care about the 42 mbps i rather have a phone that process things faster and not lag at all stupid T-mobile…. Does nobody else notice the reception difference in between the two handsets? Yea.. odd.. It might get a maintenance update a bit after release, unless they fix that before release.. but yea, two bars less right next to the GS4G is not a good look so far. The gs1 is on 3g it has no 4g signal at all here, but the gs2 is picking up a 4g signal so in conclusion the gs2 has better signal! id take a low 4g speed over a medium 3g speed! You have to be joking. 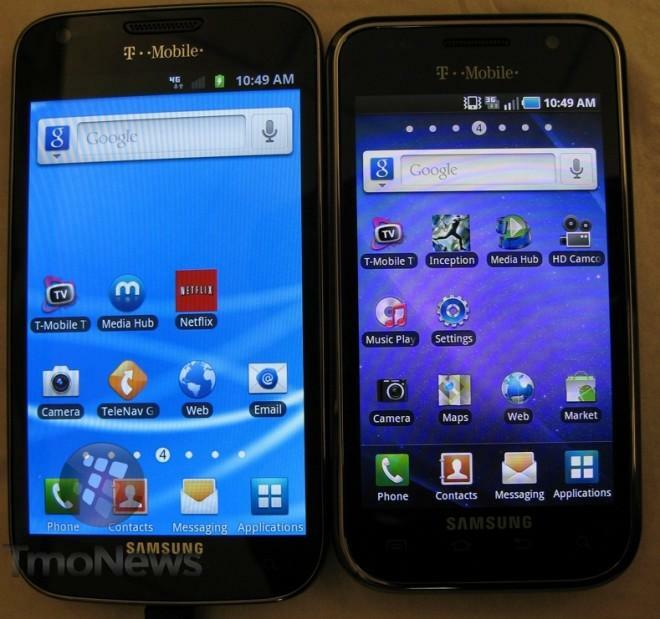 The phone in the picture next to the Samsung Galaxy S II is indeed a Galaxy S 4G. Therefore it is not the 3G one that you claim. Even still it shows the GSII lacking signal where its sibling performs better is at maintaining a signal. This makes me question whether the Qualcomm chip is at fault for this? Could be a possibility that it was hopping over to 4G when the picture was taken. It could be true, I hope, because if the next nexus is not released on T-Mobile this phone will serve me well. I’m an iPhone user but my homegirl has a Galaxy S 4G. I asked her if she is going to switch to the SGS2 and she said, “what for?… I already have an iPad. Its basically the same thing but bigger with better camera features”. Anyway I don’t care much for android but if I was to switch to it I would either get a Nexus or Sensation. I like her SGS4G but its too iPhone like and less sturdy, but still nice to look at. I like HTC phones…. Samsung has always made weak products. They have the best screens and chips. Yeah like many of the components in the iPhone 4! Lol i gotta agree with this statement and i just want to know why apple would sue their biggest components manufacturer thats crazy i know they look alike but come on no need to sue them! but i am definitely getting this awesome Galaxy S II my friends got the Sprint version and it is blazing fast and the screen is just off the HOOK!! Apple made a fortune by being the first to roll out smartphones and then tablets with mass market appeal. They had effectively monopoly profits because no one else was selling products that could compete (whether because of quality or marketing). Now that Android phones have caught up and Android tablets are (one hopes) on their way Apple’s choices are to cut prices, lose marketshare, or use the courts to shut out competition. Of course they’re trying option 3. Except sturdy means nothing, had my old iPhone screen crack and so did my girls iphone4. Where’s as my old vibrant, which used to fall at least twice a week, hadn’t a single scratch on it because of the gorilla glass. Exactly what I told him, but I just think he might be trolling. So who knows lol. Good for you you’ve already seen one in person and compared it with Bionic side by side or not? I am imagining how big texts will appear on this humongous 4.5″ pixel anemic Sasquatch. If you think this resolution is good enough, would have it been better if they squeeze more pixels at least qHD? Right? Or are we gonna play who’s the Hypocrite here. My eyes grew big upon seeing the incredible specs but I tears fell when I saw the incredibly low 480 x 800.. LMAO,, you call this a high end phone?? LOL..BTW, do you wear glasses? You’ve certainly invested a weird degree of ego and emotion into this. That’s probably not healthy. Wow I might consider giving up my cliq 2 sweet key board for this. If I buy this sgs2 will it cure my herpes??? Sounds like a personal problem to me. Therefore, please seek medical care at your nearest clinic. No, but it just might help you save 15% on your car insurance by switching to Geico….through the phones web browser! Having made the switch from the Vibrant to the Sensation 4G, I would say the biggest single difference is the height. While the extra width does make it slightly more difficult to grasp the phone (mind you, I don’t have Andre The Giant’s hands), the problem is, because I hold the phone in such way that my pinky is under the phone, keeping it from slipping down, it is nearly impossible to reach the notifications bar with my thumb. And that’s on a 4.3″ Sensation 4G. While the Galaxy S II is thinner, I think that isn’t much of an advantage when talking about usability. The 4.5″ screen’s height will make your thumb travel a lot during single hand operation. Sort of, obviously we haven’t actually seen the phone, but the Sensation 4g actually has a 16:9 (or something like that) screen ratio, because it’s meant for the ‘ultimate media experience’ or something like that. GSII looks like it has a normal screen ratio, so while it still might be an issue, the two aren’t quite comparable.